Junior Asparagus sure reminds me of my own children sometimes. 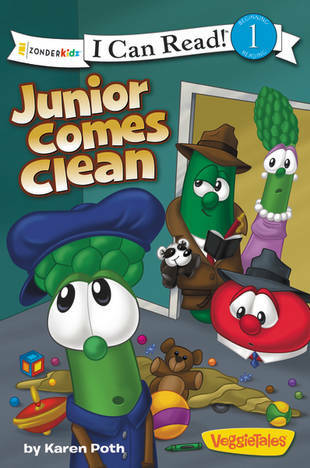 Mom Asparagus calls Detectives Bob and Larry because Junior's room was a mess! Junior says that 'Bad guys did it". Repetively Junior sticks to his claims of bad guys making the messes in the house with spilled milk, and toys hidden under the rug. Will Bob and Larry be able to find the bad guys and close this case? This is a great story about telling the truth and 'coming clean'. God is a forgiving God and we need to share these truths with our young ones.